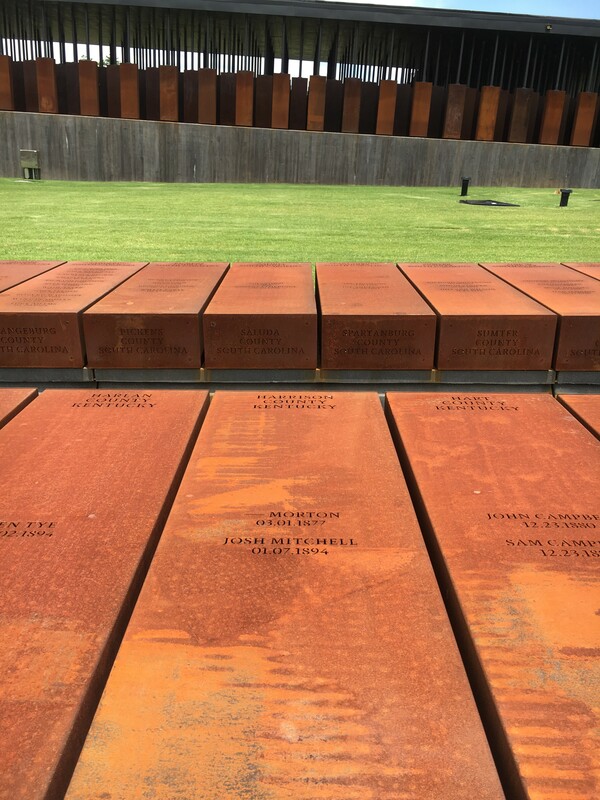 Yesterday, we visited the National Memorial for Peace and Justice in Montgomery, AL. This is one location from a new project from the Equal Justice Initiative. This site honors the thousands of African-Americans who were victims of lynching in America. While there were over 4,000 documented instances of lynching shown at the Memorial, that does not come close to the actual count that happened from around the 1890s through the 1930s. The Memorial recognizes this, and also seeks to honor those that we are not yet aware of. The site has over 800 steel monuments that represent every county in 12 states in which at least one lynching happened. 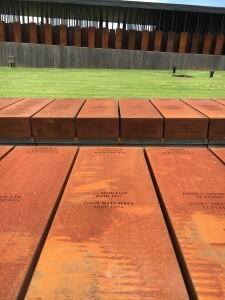 The names of the victims were engraved in the monument, along with the date of their lynching. We started by walking amongst these standing monuments, but as we walked down the slope, the monuments stayed at the same level, now suspended above us as we walked through the memorial. It was sobering and poignant to see name after name listed, often including family members who were lynched on the same day. As we exited that memorial, we came to a courtyard holding duplicates of each monument, laying down. I came to learn that these duplicates were created to be retrieved by the counties that they represent, and can be used for those counties to confront the truth of the atrocities that happened on that very soil. As I looked at these monuments laying down, I realized that they are very resemblant of coffins. Looking back at the upright monuments, I was suddenly struck with the visual that they appeared to be coffins suspended in the air, symbolic of a death that occurred from being hanged. I felt like this imagery gave these names unrest. Unrest from an unnatural death taken from them in a racial terror lynching in efforts to maintain white supremacy. Unrest for the thousands of names of victims that have yet to be discovered and properly honored. Unrest for these African-American victims as our nation has barely scratched the surface of confronting the truth of our history, and how it is built on a system of violence and terror perpetuated by white men. I pray that the next time I visit this memorial, that the majority of the monuments in the courtyard are no longer there. I pray that our nation can continue to take steps to confront our history, and fix our future. I pray that these victims, as a result of this memorial, can be appropriately given rest.